I have said it once and I will say it again…The ONLY way I can stay on track with eating well is meal prep. I struggle with having breakfast and lunch items on hand for myself. I always have healthy food for Hudson but in the morning I am scrambling to find something on the way out the door while combing crazy bed head. Lunch is the same….I forget to eat until after I finally slow down during nap time and realize my stomach is growling. I have been trying to prep those two meals for the whole week on Sunday. I bribe my mom to come help me so we can get the chopping done quickly and my sisters can entertain Hudson for me. 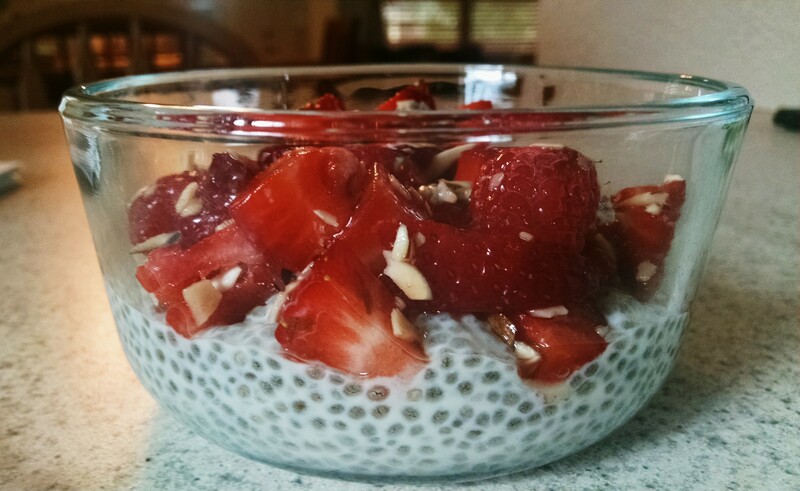 First up is Chia pudding with berry and nuts. It looks really gross but I have to say it was extremely delicious and filling. Instructions: Combine all ingredients in a glass and shake to combine. Refrigerate overnight. Stir quickly in the morning, top with berries, and enjoy! I mixed the berries and slivered almonds with a tablespoon of maple syrup, stir and placed the mixture on top. The second is oats. The first go round I made a giant pot of quick oats and placed a serving size in glass storage bowls. In the morning I can warm them up, toss in some fruit and cinnamon. But I have found a TON of overnight oats ideas on pintrest. Next week I will be trying those like this one or this. Either one would be easy to prep and delicious! 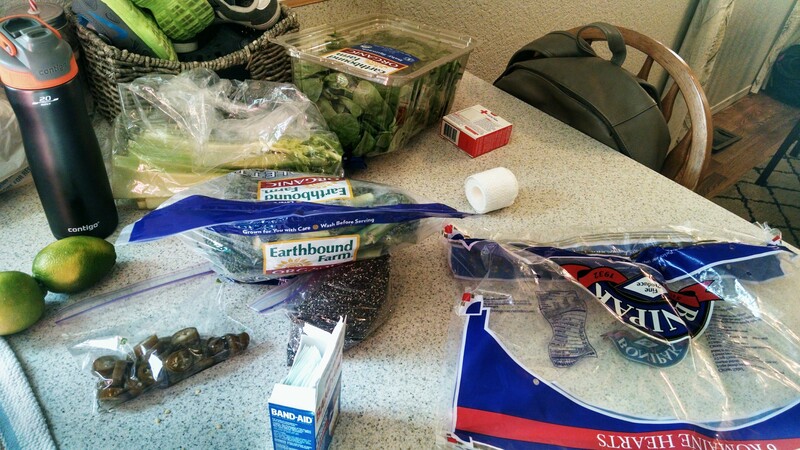 Lastly, we purchased all the produce at Costco. It is the best value and there are a lot of organic options, I stick to the dirty dozen which keep costs down My mom started chopping on the veggies and I grilled up all the chicken with a little salt and pepper. I would recommend using the 16 oz wide mouth mason jars. They fit a large salad and the wide mouth makes it easy to eat directly from the container or to dump out in a bowl. After the chicken cooled we got to work. The first layer is your protein and dressing. Then cucumbers, broccoli, or tomatoes, etc. The last layer is the romaine lettuce or spinach. I omitted cheese but you could add that in, on top of the protein. By keeping the lettuce separate from the dressing it stay crunchy until you are ready to eat. 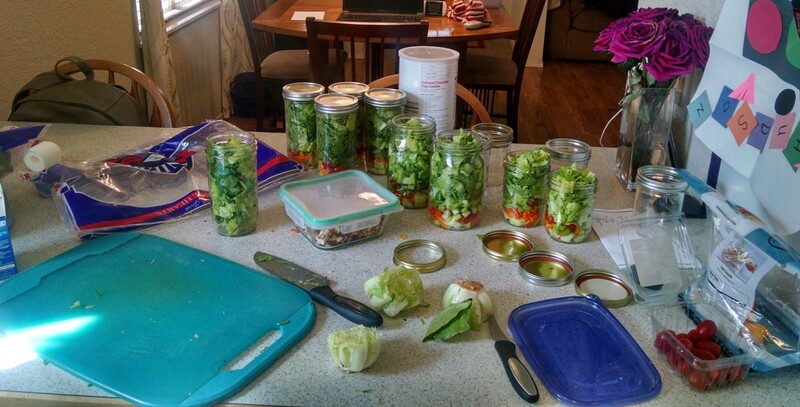 I have made a ton of different types of mason jar salads. I like to keep it interesting especially when I am trying to eat healthy which can sometimes get a little boring. Cobb Salad: ranch or vinaigrette, chicken, bacon, tomatoes, hard boiled egg, avocado, bleu cheese crumble and lettuce. Santa Fe Salad: Habanero ranch (found at Target), chicken, black beans (rinsed), corn, pickled jalapeno, cheddar jack cheese, tortilla strips, and lettuce…This one is my absolute favorite. Greek Salad: chicken, Greek vinaigrette, red onion, cherry tomatoes, feta and romaine lettuce. I hope you try one of them out. I have found meal prep to be the most important thing I can do for my health and wellness. I usually add a cup of soup along side my salad for a well rounded and filling meal. What do you do to make your days easier as a Mama?